In the aftermath of Washington D.C.’s destruction, federal government officials who survive the attack decide to physically decentralize the federal government. More emphasis is placed on individual localities—towns, cities, states—and their residents. Dimensional, interactive touch-screen kiosks are an integral part of this new system. They provide a physical presence for a government that no longer assembles in real life. 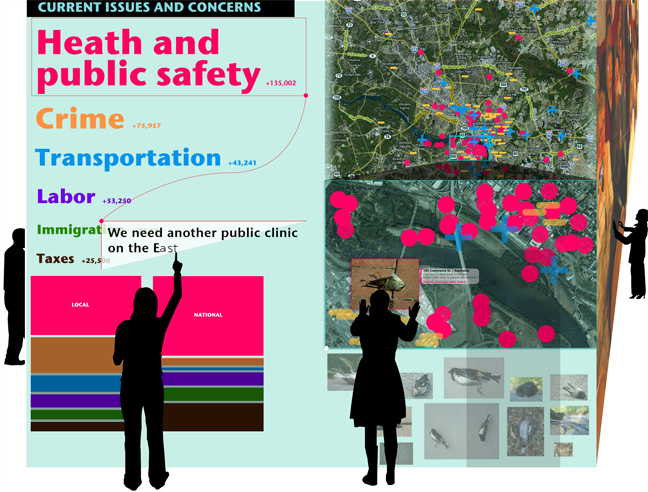 Residents can contribute comments, ideas, feedback, images, and even map exact locations that relate to local and national legislation, turning their daily experiences into a collective database of local knowledge and opinion that can be translated into laws and policies by local elected officials. People access the system through the centrally located kiosks, personal mobile communication devices and computer implants, and even [now practically archaic] personal computer systems. They can comment on and rank issues they think are most important, contribute ideas, comment on their surroundings. The kiosk can be used publicly on the outside or privately from the inside. Local concerns can be compared/contrasted with their national counterparts. Voting is tabulated, tracked and posted in real-time. Reporting of federal activities is also updated regularly through the system. People can use the system to access very detailed information about current bills, existing legislation, even profiles of elected officials and candidates. The system provides a form of accountability for a country whose government no longer meets in face to face. It helps citizens feel more connected to a government that now only exists in virtual form, and gives them an active role in shaping their own lives and immediate surroundings. Class conversations lead to an assignment from Henry Jenkins’ new book, Convergence Culture. We each took definitions from the book’s glossary and interpreted, responded to and/or investigated them…visually, of course. I Wonder Ifs: A genre defined by The Sugar Quill in which fans speculate about narrative possibilities hinted at but not explicitly depicted in the original work. Origami Unicorn: Coined by Neil Young after the addition of a minor detail to the director’s cut of Bladerunner, which encouraged speculation that the protagonist Decard might be a replicant, the term refers to any element added to a text that potentially invites reconsideration of other works in the same franchise. A quick 3D study of a phrase selected from the iChat brainstorming session. What if diversity was monochromatic? KA-THUMP. KA-THUMP. KA-THUMP. She could feel her pulse in her head as she grabbed a hoodie and bounded out into the parking lot to meet his car as it approached. Before he even had a chance to open his door to greet her, she was buckled into the passenger seat, ready to go. “Whatever! Don’t pretend like you’re not interested,” she laughed. Oh, the joy of accidental double entendres and the awkward silences that ensue. She bit her bottom lip and looked out the window as he silently turned down the road she had suggested, a half-smile slanted across his face. She wondered what he was thinking, but they both sat in silence a moment longer. “Maybe we should meet them,” she suggested, only half-joking. “What, roll up the driveway and say, ‘Hello, I like your architecture?’ Ha!” He shook his head, mocking her. No comments or quips were ever safe in this car—everything deserved a quick rebuttal. She contemplated the yellow house, which fooled the eye as it appeared to jut out from the site at a sharp diagonal. Across the street, a blank-faced, traditional bungalow stared at its eccentric neighbor. It needed to be power-washed, among other things. They silently observed how the undulations in the road seemed to mirror the range of housing alongside: Eccentric Yellow House and a few other impressive houses before it; Blank Bungalow and its monotonous neighbors on the other side of the street slowly giving way to a duplex or two, and then, at the bottom hill, “Ah, the projects!” he exclaimed, with feigned admiration. “Oh, but it’s so fascinating! Why do you think it’s hard for you to accept?” she asked. An eternity of two minutes later, they pulled up, parked, and exited the car simultaneously. She glanced over at him and they spontaneously raced to the entrance, laughing. He shimmied up the ladder, hung from the top ledge, and deftly piked his legs through the opening, sliding inside in what seemed one fluid motion. “Oh God.” she said, still standing at the bottom of the short ladder. She looked up at the opening where he had disappeared. “Come ON.” he said, poking his grin out of the rectangular portal. She smiled back at him, but he saw the panic flicker across her eyes. “I’ll help you,” he added, quietly and sincerely. It wasn’t as difficult as she thought it might be, but she felt her breakfast lurch towards her throat once or twice. She couldn’t tell if it was from fear of falling on the unforgiving pavement below or fear of embarrassing herself in front of him. Or maybe it was just because he had a firm hold on her legs to assist her as she clambered inside with far less grace. She blinked. He could tell her eyes hadn’t adjusted to the darkness of the dumpster, and the four openings to the outside world abused their pupils every time they glanced towards the light. “Here, I just found a motherload of these.” He handed her a National Geographic with a photo of a brilliant butterfly on the cover. “Oooh, let me see!” he plucked it out of her hands. “Seventeen? !” He chucked it to the side, where it made a loud thud against the metal wall of the recycling dumpster. “Very funny,” he said, scooping up a handful of dutifully shredded credit card applications. “VERY funny,” he repeated as he showered her with this repurposed confetti, someone’s attempt to avoid identity theft. “HEY! Act your age, not your favorite magazine title!” She swatted at the shreds in her hair, stooping down to hurtle a handful back at him. The box lid grew heavy with fortuitous discoveries: last week’s Time; Rolling Stone from 1999 with the Beastie Boys on the cover, all dressed in red; Oprah’s covergirl smile modified with an inky goatee, devilish eyebrows, and bat wings; a bridal magazine from 1946; a year’s worth of Architectural Record—the grand prize. “What do you have there?” he asked. She was working at a small, square cardboard mailer. “What? Really? What is that? Let me see!” he sifted his way towards her, wading through the knee-deep piles of popular pulp. “Shhh,” he quietly moved towards the far wall, towards the emptier end of the container. She silently released her feet from their periodical shackles and slid down the mountain of paper towards him, a slight shuffling of pages in her wake. She stood next to him, backs pressed against the metal wall. They watched the light. Outside, a man was talking to someone. He sounded like he was behind them, probably dumping a load of newspapers. That depository wasn’t nearly as interesting: just a heap of yellowing News and Observers sprinkled with the occasional USA Today, Wall Street Journal, and a rare glimmer of New York Times. It was all yesterday’s news, fit for lining the kitchen table for a messy craft project or cleaning the bird cage. White paper and magazines was a far more dynamic mosaic of castaways. Then the window at the opposite end of the bin was dark, and a fresh stream of papers snowed on the peak of the magazine mountain as the man emptied his box into their hideaway. The darkness lifted and the opening was light again; the intruder was gone. The opening grew dark again as a balding head invaded their space. It panned across the contents of the bin as the intruder’s eyes attempted to acclimate to the darkness. They froze, but he had already spotted them. “What are you kids doing in here?” the intruder demanded. His pinkie found one of her fingers and clutched it. “Looking for magazines,” he said. Our class is hosting a symposium (I guess I haven’t mentioned it anywhere yet on this blog…maybe it’s time for a new category) at the end of November. It will examine collaboration and co-creation from a design perspective, hopefully discussing new roles and opportunities (and attitudes?) for designers as audiences create and participate in design and communications. In lieu of yet another standard classroom discussion, we engaged in a fast-paced, chat-based exercise to “think aloud” about some of the topics related to our symposium theme. “Thank you for calling Design Control, this is Lisa.” She shifted the phone to her left hand so she could continue mousing with her right—no sense losing valuable design time during a phone conversation. “Hello Lisa. This is Helen Ahandbasket from Anonymous Nonprofit,” announced the matronly voice at the other end of the line. “Oh, good afternoon, Helen! What can I do for you today?” Lisa opened the organization’s file up on her screen so that she could quickly reference whatever project her client wanted to discuss. “Well, Lisa…” Helen’s voice trailed off uncomfortably. Lisa’s gut twisted. She wasn’t sure what would come next, but she knew it wasn’t going to be good. “Yes?” Lisa asked. She realized she was compulsively clicking the “Send/Receive” button in her email program—a nervous habit—and stopped herself in order to pay full attention to Helen. “Helen, what’s wrong? Was there a problem with that last mailing we did?” Lisa was beginning to worry. She felt her throat tighten. “Oh no, no, no dear, it was great—everything you do is lovely. We’re really pleased with Design Control’s work. I mean, I am really pleased. That’s what makes this so hard! There’s no easy way to say this, so I’m just going to tell you: Kurt Andterse, the new chairman of our board of directors, thinks we should design this next fundraising campaign…ourselves.” Helen blurted this quickly; she was obviously not happy with Kurt’s decision. “Not exactly,” Helen sighed. “Kurt thinks—well—he thinks we can design it ourselves!” She repeated. “A book?” Lisa asked, though she was fairly certain what Helen would say. “Ellen Lupton?” Lisa interrupted. She felt slightly sick. “Yes, exactly! So you’ve heard of it?” Helen asked, relieved that Lisa might understand. Lisa took a sip from her coffee mug. “I’ve seen it.” Her stomach churned. The coffee didn’t help. “But you don’t think we should do this?” Helen asked. “I just don’t think you can get the experience and knowledge you need to design a successful fundraising campaign from flipping through one book.” Lisa said. “‘Probably right? '” Lisa thought to herself. She didn’t really know what to say. She knew she was walking a fine line with Helen, who clearly felt pressure from this Kurt guy to line the organization’s coffers by firing the design team. Whether Design Control kept them as a client or not, Lisa did not want to see the folks from Helen’s organization shoot themselves in the foot. “Of course, Lisa. I am always interested in your opinion.” Helen realized she had wound her telephone cord into a tight knot. This conversation would be much easier if she hadn’t developed such a friendly working relationship with Lisa. But she didn’t want Kurt to make the call. That would have been even worse. “Well, Helen, as you know, I haven’t worked with Kurt, and because he is new I don’t think he realizes that hiring designers actually makes a positive impact on the organization’s bottom line, especially for these campaigns of yours. He may be determined to try this himself, but first of all, I don’t think he has considered the time and energy you’ll all be spending away from your other duties while you try to assemble this campaign. And secondly, I wish Kurt would realize that working with a designer—whether it’s us or someone else—is an investment in the overall outcome of the project. Yes, hiring a design team is an initial investment, but you’re hiring our knowledge, experience, taste and expertise. We’re trained and practiced in this, and the responses and contributions you receive are directly connected to the communications we create for you.” Lisa took a deep breath and another long swig of her coffee. “I will talk to him, Lisa. Thank you for being so understanding about this.” Helen picked at the phone cord knot. “Good luck, Helen. Let me know what happens. You know where to reach us if you need our help.” Lisa said. After they hung up, Lisa turned to her business partner, Nick. When I figure out how to make my animation (quicktime) work on this blog, I’ll post it here. 🙂 In the meantime, if you have tips or suggestions, please post them here.